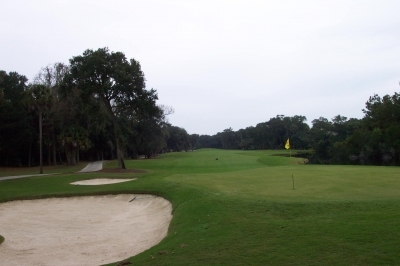 KIAWAH ISLAND, SC � When talking about golf courses, much has been written about how a golf architect does his best work when he�s friendly to the high handicapper, yet demanding to the better players. The ocean's just over the dunes on the par three 14th hole. Don't forget to soak in the beauty of the surroundings. It�s the ultimate design challenge, to leave enough room for occasional players, but also narrow the targets for those actually seeking a score. 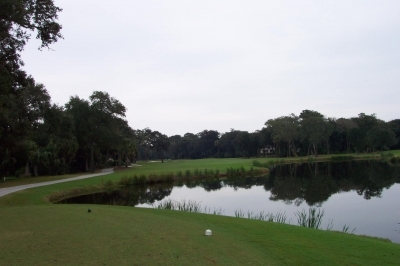 Jack Nicklaus has done just that at Kiawah Island Golf Resort�s Turtle Point, a layout that�s achieved those lofty planning goals � it�s forgiving and fun for the high handicapper, yet a difficult test for those looking to pit their skills versus the golf course. The par four 9th hole plays longer than its 428-yards would indicate. Take an extra club on the approach. 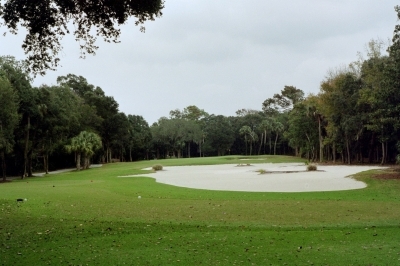 Turtle Point isn�t outstandingly wide, which demands a bit more accuracy off the tee than its siblings Cougar Point (narrower than Turtle, but also shorter) or Osprey Point, a fact that adds to its tournament character. Miller says it plays like all Nicklaus courses, where there�s an adequate amount of room to play your ball, yet the architect finds a way to reward tee shots placed strategically on the correct side of the fairway. The 408-yard, par four 11th hole has trouble from tee to green, but is an excellent example of Turtle Point's strategic qualities. Then the Golden Bear stopped by to have a look for himself. �The first thing that struck Jack, not having been there since the course opened � was, with all the development having grown in around the course, how tight it now appeared. The corridors they used when Turtle Point was built are a little narrower than we use these days � so based on that, we decided to change the philosophy around the greens, to �collect� the ball instead of potentially penalize a missed shot, essentially make it a little more forgiving to make up for the narrow passageways,� Heatwole said. The longest par three on the course, the 4th looks tight even for a one-shotter. �We took some of the greens where maybe they would repel a ball off an edge and created some smoother ends to create collection and fairway areas that wrapped around the greens. In doing that, we eliminated some of the bunkers that weren�t very visible, and just created low-grass fairway collection areas instead. Finally, we took some of the greens and put stronger pitches in them � they�d become a little bit �soft,� so Jack wanted to strengthen the actual putting surfaces to make them more undulating,� Heatwole added. What the architect giveth the duffer in eliminating potential hazards around the putting surfaces, he taketh from the low-handicapper by requiring more precision in getting close to the hole for a make-able putt. A fair trade, most reasonable folks would say. The brand new Sanctuary Hotel is the backdrop for the par three 16th hole. Not to be outdone, the ocean's on your left. A lot of designers seem to be going away from heavy bunkering around greens in favor of these types of short-mowed chipping areas, which favors a good player who can employ either a lob type shot, or has honed a bump-and-run for distance. Likewise, the resort guest who plays only a few times a year can even putt the ball from these lies if he prefers, all the while keeping play moving. These are subtle distinctions, of course, but for those playing Turtle Point for the first time, you�ll probably most remember the different personalities of the layout. 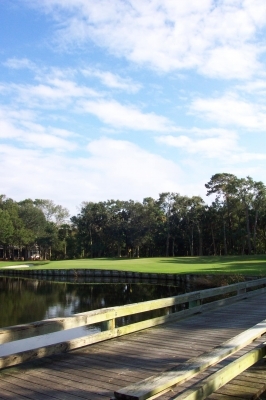 Perhaps more than the other Kiawah Resort golf courses, Turtle has several different settings. 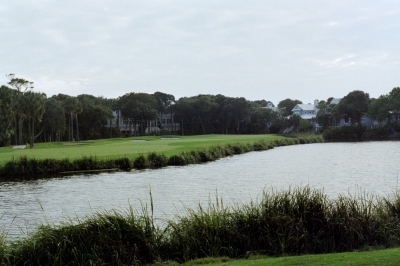 It starts out playing down tree-lined corridors, opens up a bit, moves down some more corridors, then comes to three of the best holes in the entire Kiawah experience on the back nine � two par threes and a short par four that brush up against the ocean dunes, then comes back towards the clubhouse for two more challenging holes. Despite the different mix of features, the course seamlessly fits its environment(s). 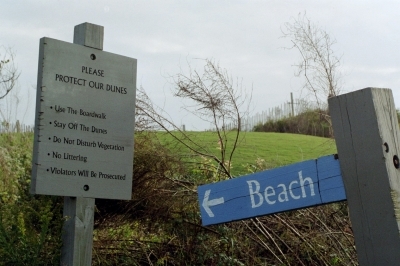 As if the sound of crashing waves wouldn't give it away, signs will point you in the right direction -- for after the round, of course. �I think Turtle Point blends naturally with the terrain � the inland holes that are treed, and also when you get out to the ocean holes, which basically utilize the sand dunes and undulations along the ocean. There aren�t too many other golf courses that have that kind of variety, a few ocean holes, a few that are kind of open, and some that are dictated by trees,� Miller pointed out. �Some, like the Ocean Course, have many holes out in the dunes, but a lot of people have said they like the variety right here at Turtle Point,� Miller added. The par five 13th hole is of the risk-reward variety -- but this body of water proved insurmountable for one member of our party. Resort players aren�t the only ones. Miller said when Nicklaus came back on the Tuesday after his Memorial Tournament ended in 2000, he said they weren�t even going to touch those three holes by the ocean. They re-grassed �em and redid the faces of the bunkers, but left the rest to what Jack had created, and what nature had altered over the years. That�s not to mention the environmental concerns. Those three holes are just over the dunes from the roaring ocean, and Miller said that there are Loggerhead Turtle (an endangered species) nests in the dunes � which perhaps is the reason why the course was called �Turtle Point,� though Miller couldn�t say for certain that�s why. On the day we played, there was a family enjoying the beach and the waves, which also added a touch of �atmosphere� to the surroundings that you don�t get just anywhere. The changes to the golf course weren�t the only ones made in 2000. A brand new clubhouse was built to replace the old one, which everyone seems to agree was pretty inadequate. You�d never know it these days � what a beautiful piece of architecture stands there in 2005. And they also added a brand new learning center, and who better to lead it than Miller himself, who once played on the PGA Tour. There's a minor forced carry off the tee of the par five 2nd hole. Slicers beware. The greens also benefited from the upgrade work, and in this sense, it�s more than just the shapes. �We�re very fortunate in our conditioning, and a lot of that�s due to the switch we made from Tif-Dwarf Bermuda grass greens to Tif-Eagle in 2000. They�re much easier to maintain, and they putt better, too. Turtle�s greens have been called the �best conditioned greens� at Kiawah Resort, and we�re very proud of that,� Miller said. 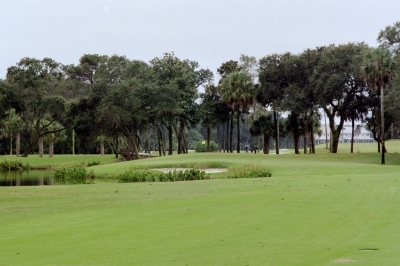 Highlights at Turtle Point include the first hole, which basically sets the tone for the entire golf course. It�s not an overpowering hole at 413 yards (from the gold tees), but it�s straight-on, and there�s a large oak tree jutting in from the left side in the tee shot landing area. If your tee ball�s too far left, you�ll have to go over, around or under that big tree on your second shot � hence, the need to keep your ball on the correct (right) side of the fairway. Looking back from the par four 3rd hole. Water, sand and a tiered green make this a pretty difficult test at 409 yards. The eighth hole is the longest par four at Turtle Point, a 468-yard bruiser that�ll challenge you to blast it long off the tee, then hit a nicely placed mid to long-iron into the green. Par�s a great score on that one. The back nine�s got a number of great holes, though you�d certainly have to pick the ocean trio � especially the par threes -- as the highlights. The fourteenth hole moves towards the ocean, a 173-yarder that almost looks like you�re shooting between dunes to get there. 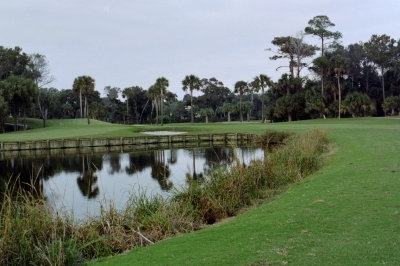 According to Miller, the hole�s received a number of compliments over the years from some big golf names, such as Tom Weiskopf (who said it�s the way an ocean par three should look) and Rory Sabbatini, who played it while winning the World Cup in 2003, over at the Ocean Course (he said Turtle�s number fourteen was one of the best par threes he�s ever played). Nearing the end on the par four 18th hole. You'll be anxious to try Turtle Point again. The sixteenth hole is a perfect case of a classic design strategy that only someone like Nicklaus, with his vast knowledge of golf courses around the world and the game itself, could effectively implement. But that kind of sums up the Turtle Point course in a nutshell � it�s tough, but then again, it�s not so tough. It�s truly, the best of both worlds, all in one golf course. 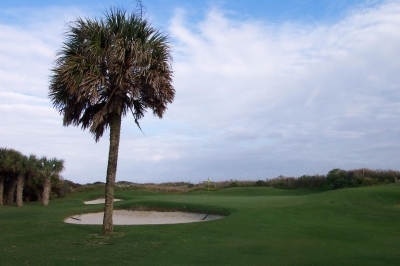 Turtle Point�s probably not as aesthetically pleasing as some of Kiawah�s other offerings, but for pure golf, it�s hard to beat. 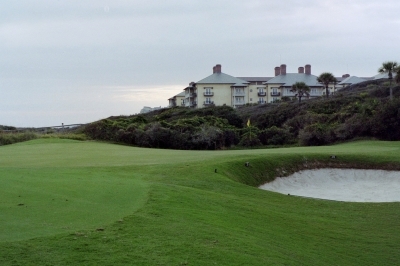 Note: Check the links below for more stories and reviews of Kiawah Island Golf Resort's excellent offerings.